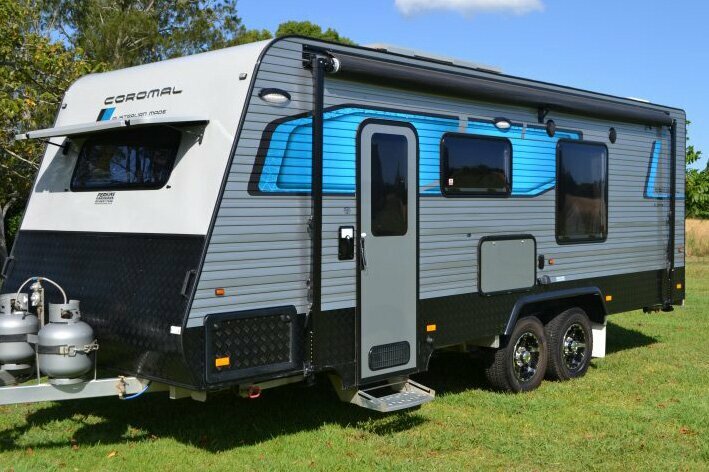 COROMAL celebrates four decades of caravan manufacturing in 2017 and thanks to a recent makeover, has never looked better. Turning 40 used to be a good excuse to make some radical changes in life, like splurging on a motorbike or impractical sports car. Four decades of caravan building is a worthy achievement and for Coromal it has coincided with some management changes in the parent Fleetwood group. This has brought about a major re-design of the Coromal range, with its sister brand Windsor also getting a refresh. To call if a facelift wo uld be an understatement. The changes are significant, both inside and out. Perhaps the biggest innovation has been the introduction of a slide-out model to the range. There are 11 floor plans in the Element range ranging from 5.5m in length, up to 6.9m. Most have a queen bed up front and an ensuite at the rear. The slide out model as reviewed is 6.6m (21’6”) in body length and has the bed at the mid-rear, extending out to make the whole van more spacious. The only downside to this style of design is you need to scramble over the bed to get to the bathroom if you stop beside the road and can’t extend the slide-out, but it’s a very minor gripe when you consider the overall benefits. One thing that hasn’t changed is the construction standard, with Coromal Caravans one of only a few still building on aluminium frames. They’re strong, lightweight and built to last, which is why you still see so many aluminum-framed vans from 50 years ago still around. The front rear and roof are finished in a tough composite, but the sides are finished in aluminium too, which is far easier to repair should there be a knock or a bump during what should be a very long life of this van. It’s finished with black checkerplate around the base and smart blue and black decals. Also worth noting outside is a full-length awning and underneath that is a fold down table, stereo speakers and TV point. We also liked the smart 15” alloys, plenty of storage spaces and a handy water tap on the draw bar. There’s 80 litres of water storage and our test van came with a 150w solar system, allowing you to go off grid and free camp for days at a time. Stepping inside, flick the stitch on the electric slide out and 10 seconds later you find yourself inside an incredibly light and spacious van. There’s plenty of room all around the bed, a large panoramic window at the base to lie in and gaze out of, then the bathroom is just a step away. It has all the extras you’d expect in a luxury van of this price including a top load washer and above-bench wash basin. Disappointingly in out test van this basin was made of some sort of plastic synthetic substance, which might help keep weight down a few kilos, although frankly I’d be opting to pay a couple of hundred dollars more and get the shiny ceramic version. Best of all is the full-size shower, one of the biggest units I’ve seen in a caravan plus a proper solid sliding door closing the bathroom off from the main cabin. The overall look and feel of the new Coromal interior is first class, with the latest laminates and a smart use of colours. Our test model had contemporary wood grain look floor, creamy white cupboards and bench tops matched with mocha coloured doors on the hatch cupboards at head level. The same dark brown hews were used in the full-leather dinette and the fridge door. The fridge, by the way, is a decent 190 litre 3 way model. There’s heaps of storage, I counted 10 good-sized drawers – all soft-closing and with some particularly good hatches – stylish and secure. The kitchen space is excellent. Lots of bench space, a good size sink, a microwave, grill and four burner stove. If you want an oven, that’s a $650 extra. Apparently most people don’t these days. Everything is perfectly positioned in this van. Forty years of experience shows in getting the little details right, like putting the TV bracket on the wall in the most handy space and having power plugs and 12v USB points on both sides of the queen bed. Most importantly it’s a van built for cruising with Coromal’s patented “Ezy Tow” independent suspension system and AL-KO’s Electronic Stability Control. This reduces the risk of caravan sway and keeps your insurance premiums down. 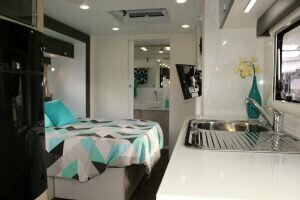 Overall this is a well-engineered caravan and thanks to the make-over is also very stylish with a well laid-out interior space. If you’re in the market for a top of the range van with slide-out, this one is definitely worth checking out. 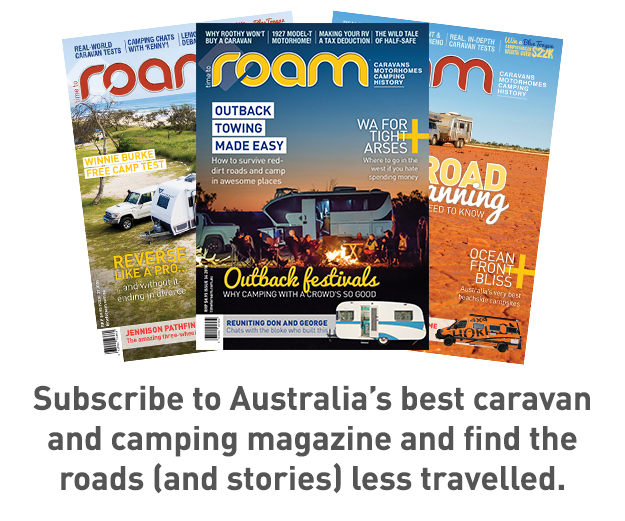 The founding editor of ROAM, Rod lived in a Viscount caravan as a cadet journalist in the 1980s. The idea for Time to Roam came after he inherited the caravan from his Aunt Dolce and he set about restoring it.